ABOUTDon’t worry, our story isn’t sad. BLOGWicked smaht learnings and such. WORKLook at what we did! Turn the heat up to 71°. Write me a blog post. Okay, maybe writing a blog post is beyond the abilities of Alexa, the “wake word” for the artificial intelligence software inside the Amazon Echo smart-home device, but “she” does have more than 1,400 unique skills. Amazon took a gamble with the Echo in 2014, but today the e-commerce giant has a huge hit on its hands that will likely become one of the next big marketing trends. Virtual assistants aren’t perfect (yet?!). Alexa is great with basic tasks like playing music, ordering products, and telling you what time the Boston Red Sox play, but she suffers from unreliable communication from time to time. No Alexa, I wanted to listen to “American Pie,” not order an Apple Pie from Amazon Prime. 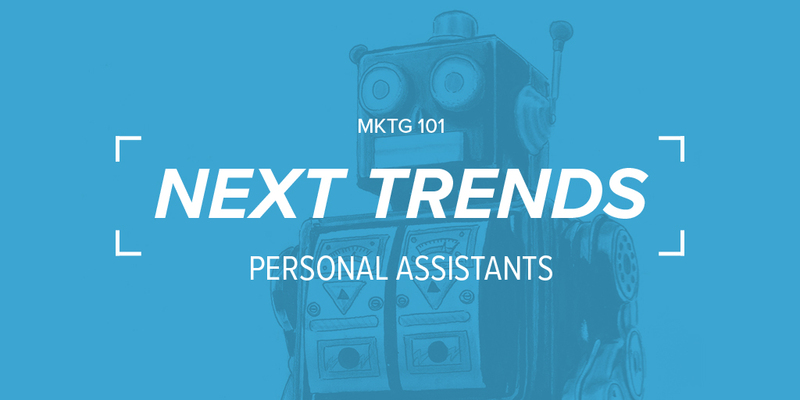 Still, consumers are growing more accustomed to having a personal assistant living on their kitchen counters and in their family rooms. With success comes competition, though, so Amazon is about to get a deep-pocketed competitor in the virtual assistant market. VIRTUAL ASSISTANTS ARE NOT A FAD, ARE HERE TO STAY, AND YOU CAN CONSIDER THIS A HUGE OPPORTUNITY. See, aside from ecomm connectivity, language processing, machine learning, and all of the nifty tech that makes these kittens purr, virtual assistants can help brands connect to consumers on an emotional level. As Marketing 101 taught us all, creating a more intimate experience between brand and consumer builds loyalty while bridging the gap between arbitrary emotional connection and personal interaction. Consumers watch videos, listen to podcasts, and read ad copy. But only virtual assistants allow brands to speak back, which creates addictive closure to the dopamine loop that other mediums cannot accomplish. SO WHAT ARE SOME OF THE COOL WAYS BRANDS ARE CURRENTLY LEVERAGING ALEXA? It’s never too late for that beach body! Fitbit lets you track your daily stats and receive progress updates on your daily & weekly goals. Order Red Sox playoff tickets with StubHub. Johnnie Walker will help you pick the perfect blend of whiskey. Speaking of whiskey, after you’ve had maybe one too many glasses of Scotch, hail a ride home on Uber and make that questionable late-night Domino’s order. Book your next vacation with Kayak or make sure your flight is on time before heading to the airport. But do that the day after Scotch and Domino’s. Make bill payments, check your account balance, and track your spending with Capital One. Super, another person telling you you’re spending too much! Forgot Mother’s Day? Valentine’s Day slip your mind? Order a heart-melting bouquet with 1-800-Flowers.com. Oh, and good luck to you. Samsung actually integrated the Alexa software into their newest smart fridge. So yes, now you have a companion to talk to during your midnight snack. Smart homes, smart homes, smart homes. There are way too many products to name here, but GE, Philips, Google Nest, Samsung, and Belkin are just a few of the players in this game. OH, AND DISNEY OF COURSE. The key takeaway here is your brand has an opportunity to become part of the early adopter ecosystem. The dev team here at Saltwater recognizes the future opportunity in this space so we’re actively exploring the Alexa Skills Kit, looking for a brand ready to lunge at the opportunity. It’s time to start thinking of how your brand might leverage this new technology.